It's the rare book that I read over a 24-hour time period. I usually like to savor novels over a few days/weeks, especially the ones I'm particularly enjoying. 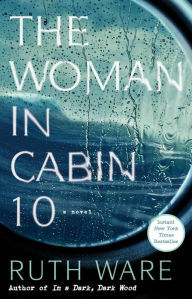 Ruth Ware's The Woman in Cabin 10 was the exception, as I couldn't put it down and raced to the end to see how Ware would finish it. Travel journalist Lo Blacklock has just been burglarized at her home but doesn't want to cancel the major assignment she's been given at work: to write about her experience during a week on a new cruise boat. At the beginning, everything seems wonderful -- luxurious accommodations, delicious food/drink, and pleasant travel companions. This is a tiny vessel, with only ten cabins, but the last cabin is empty due to a cancellation. But one night, Lo hears what sounds like someone being dumped overboard from that cabin; she can't get anyone to believe her though because that cabin is supposed to be empty. Except it isn't -- Lo had previously knocked on that door and talked with the woman who she thought was the inhabitant. So what's going on here? Did Lo witness something horrible? Is she going mad because of the burglary? As readers, we're never quite sure. With the mysterious premise and plenty of suspects to go around, The Woman in Cabin 10 reads like an Agatha Christie novel. It's well written with tons of twists, and Ware succeeds in giving the reader the same sense of claustrophobia that Lo is going through. I couldn't put it down.